With its identical twin Needwood House, Nicholl House, is one of the four eight-storey blocks on the Woodberry Down Estate. This estate was one of the largest and most prestigious, built by the London County Council (LCC) in the 1940s. 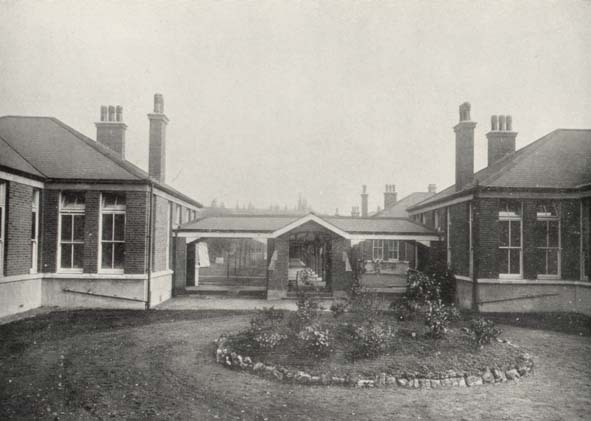 It was also built at a unique period in the history of the LCC Architects’ Department, when the design of housing came under the control of the Valuer’s Department. These two blocks, with their deep overhanging eaves, bold profiles and cantilevered balconies on the upper floors, appear redolent of a continental modernism and represent a sharp departure from interwar schemes. Now with the complete redevelopment of the Estate, they face an uncertain future. What is curious is no one knows for sure, who designed them. The most likely candidate is John Henry Forshaw, the architect to the LCC from 1941 to 1945. Responsible for the layout of the whole estate, he had advocated the building of these more expensive eight-storey blocks. This had been in part prompted by the 1943 County of London Plan, which he had co-authored with town planner Sir Patrick Abercrombie. One of the most influential documents on post-war planning it advocated a radical rethink on housing provision, from what had gone hitherto. Instead of slum clearance programmes and the building of vast cottage estates on the outer fringes, London was to be divided into a series of ‘zones’, in which a higher density of housing would be allocated to the central area and a lower density to the outer boroughs. One of its principal recommendations was to accommodate different sizes of family by building a combination of houses and flats. The new housing would follow the continental model (as seen in Sweden) of a mixture of high-rise and low-rise apartment blocks and houses. Woodberry Down had been planned before the war, when the LCC had an active policy of slum clearance, which included moving people out of the congested inner city areas to the suburbs and in the late 1930s, this part of Stoke Newington was deemed suburbia. An estate was planned on a site overlooking the reservoirs near to the New River in 1936. The initial scheme in 1938 comprised of a number of two to five-storey blocks arranged in a massive horseshoe. But in 1943, as the County of London Plan was coming to fruition, a new scheme was put forward, which was in essence the one built. This was a layout, whereby most of the blocks were laid out in parallel lines orientated north-south at right angles to the reservoirs, but on a diagonal with Lordship Road. Forshaw’s introduction of the eight-storey blocks was to avoid the monotony of rows of ‘walk-up’ blocks of five-storeys, with long balconies and hipped roofs. There were also three-storey blocks with maisonettes and two-storey blocks of flats for older people. The scheme was approved in 1943, albeit with reservations about costs by the LCC’s Valuer, Cyril Walker. Until the end of war, there was a running battle between Forshaw, who wanted high standards; and the Valuer, who was concerned with costs and fast production. Forshaw resigned in 1945 and the whole allocation of post-war housing design and production was transferred to the Valuer’s Department. Fortunately, the final layout including the eight-storey blocks was approved a month before Forshaw’s resignation, so he can be claimed as the designer. The eight-storey blocks were built of concrete, as steel and brick were in short supply after the war. The facades faced east-west, so that all rooms received sunshine throughout the day, but were placed far enough apart to allow for plenty of light and air. Accommodation was generous, each block providing 79 flats, ranging from one to four bedrooms (with built-in cupboards) and a separate bathroom and WC. Five lifts as well as staircases were provided, which opened on to balconies to the three upper floors. In 1949, the first blocks to be completed were Nicholl House and Needwood House. They were centrally heated, albeit with one radiator in the largest bedroom and the living room, plus an electric fire. Originally, the exteriors were painted in cream and light blue called ‘Tyrolean roughcast’. There has been speculation, as to the inspiration for their striking design. No doubt, some ideas from Europe before the war, as continental modernism impacted on British architecture. 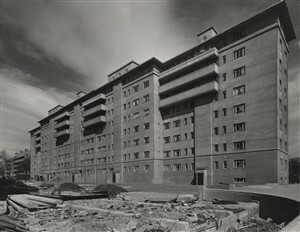 During the war neutral countries like Sweden continued to design modern public housing. In September 1943, the Architectural Review, devoted a whole issue to Swedish architecture, paving the way for Swedish influence on post-war British housing. But much closer to home in nearby Amhurst Road is Evelyn Court, an estate of ten five-storey ‘walk-up’ blocks designed by Burnet, Tait & Lorne for the Four Per Cent Industrial Dwellings Company in 1934-5. These tall, rectangular blocks, flat fronted and flat roofed (originally painted white with the central stair towers painted green) with metal windows, were not dissimilar to flats in interwar Germany. More importantly, though, was the unique nature of their construction – a monolithic reinforced concrete frame faced in render. This system was invented by Evelyn Court’s contractors Holland, Hannen & Cubitt, who subsequently used it at Woodberry Down for the eight-storey blocks. In 1947, Robert Matthew was appointed as Superintending Architect to the LCC, with Leslie Martin as his deputy. Matthew later successfully lobbied for housing to be given back to the LCC Architects’ Department, following criticism of the ‘Valuer’s blocks’ in the architectural press. As the emphasis in the 1950s swung towards point blocks and Corbusian slabs, the Woodberry Down slabs were seen as a lumpy and half-hearted modernism. Nevertheless, it is possible to appreciate their architectural and historical significance, as they represent the transition between the design of public housing by the LCC in the 1930s and the ideas for urban housing expressed by the authors of the County of London Plan. This page was added by Lisa Rigg on 15/09/2009.